Following on from the most recent Star Trek movie, Star Trek issue 1 is based on the original series first season episode Where No Man Has Gone Before, the show’s second pilot, which introduced Captain Kirk. In this version, following their battle with Nero, the newly minted Captain Kirk and the crew of the USS Enterprise have taken off on a mission to go beyond the known galaxy. However, when they reach the edge they discover the black box from the SS Valiant. The logs reveal that a disaster of unknown origin befell the Valiant and the ship self-destructed. Kirk and crew must figure out what happened to the Valiant without letting the Enterprise suffer the same mysterious fate. If this new series means to continue as it has started here then it looks like readers are in for a select re-visiting of the classic stories from the original 1960s show. However, reading issue one, I found myself unable to decide whether this was an endearing tribute to the much-loved original show or a cheap trick designed to keep fans occupied in the lull between films while expending a minimum of creative effort. After all, do we really want to see the new versions of the original characters going through the motions in stories we’re already familiar with? On the other hand, perhaps this is an opportunity to highlight the fact that, although the two timelines are similar, they are not the same and some events will unfold in different and unexpected ways. If the aim of this series is to put a new spin on old stories then it could prove very entertaining. I did note the absence of Elizabeth Dehner in this new version, an omission that would surely necessitate some fairly major plot deviations from the show, so perhaps Johnson does have some new twists and turns in store for readers after all. Those fans who were put off by the fact that a cadet straight out of the Academy was given command of a starship at the end of the 2009 movie might find that this first issue of Star Trek rubs salt in that wound. One of Kirk’s first acts as captain was apparently to bring aboard old Academy chums Kelso and Mitchell. I realise that the writers had to introduce Gary Mitchell to the story somehow but surely they could’ve thought of something better than Kirk recruiting his college buddies? The fact that we first meet Mitchell while he, Kirk and Kelso are playing three-dimensional chess in the rec room just serves to underscore how ridiculously young Kirk is to be in command of a starship. Stephen Molnar does a great job of translating the actors into art. In particular he captures the distinctive body language of Kirk and Spock perfectly. The art in general is very good, the colours are rich and vibrant and the inking isn’t too heavy-handed. One element I particularly enjoyed was the use of special speech bubbles for intraship communication, I thought that was a nice touch. The über-shiny design of the bridge in the film unfortunately doesn’t come across as well in the comic book medium, there is a tendency for panels set on the bridge to lack depth with all that glittering glass in frame, but again Molnar has done a good job of it. My only real criticism of the art is that they can’t seem to decide what colour Scotty’s hair is: throughout the issue it varies from red to brown to black and back again. There were some details in the interactions between characters that I found slightly off. The first was the fact that Kirk and Spock seem to already be on first name terms. Given that they have only just moved past an extended period of intense dislike of one another I thought that maybe this was a little premature. I also found it awkward the way the writers seemed to shoehorn a brief moment between Spock and Uhura into the story. It felt forced and unnecessary. We all know they’re a couple and we all know that this new Spock is more in touch with his human emotions that the original Spock; there’s no need to rub our noses in it. Whether this series is really worth reading has yet to be seen and depends on how the familiar stories unfold. 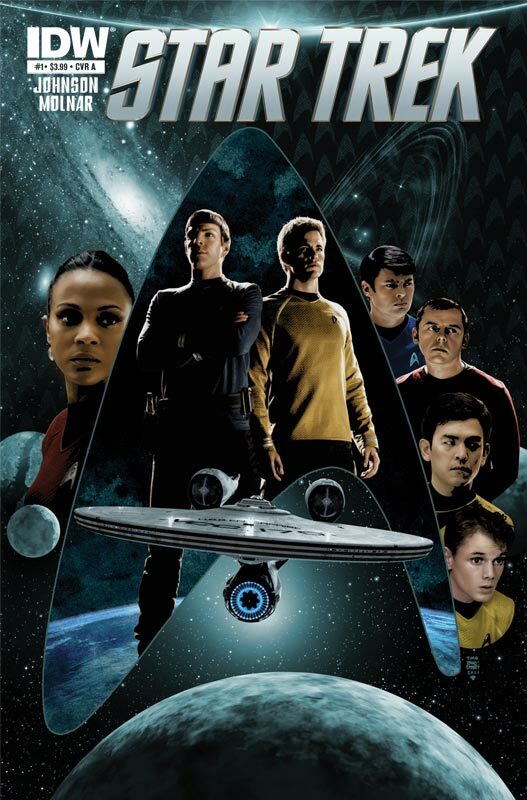 If Johnson brings some originality and fresh ideas into the mix then I think Star Trek could be a lot of fun but if it’s destined to be a blow-by-blow re-enactment of the television show then it will get dull very quickly. So far the first issue remains inconclusive, it has potential but only the next couple of issues can indicate where the series is really headed. Check out our review of issue 1 of the Star Trek / Legion of Superheroes crossover.